With more than 4000 artisans at work in the North Carolina Mountains, the Smokies is indeed a hotbed of arts and crafts activity. 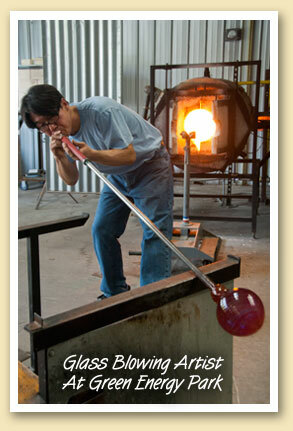 And one of the hottest (literally) is the glassblowing studio in neighboring Dillsboro. Above, noted glass artist Tadashi Torii works in molten glass from an oven fueled by captured landfill gas at the Jackson County Green Energy Park. Since opening in 2006, the Green Energy Park has provided studios for a variety of artists and businesses that utilize its green energy resources, including blacksmiths, metal artists, potters and the commercial growers that rent the Park’s greenhouse facilities. Tours of the Park are available by appointment. Call 828-631-0271.